Relax with a lush beautiful lawn under your feet. Do you have a weedy, barren lawn, bare spots, or sparely established grass? Have you over seeded year after year and your lawn is still not the lush green carpet that you envision? Renovate your lawn and install sod or synthetic grass. We provide expert advice and installation whether you prefer a lush lawn of fescue, zoysia, or the near zero maintenance of synthetic grass. Instant grass! Sod turf grass is affordable and preferable to seeding in most situations. Unlike sowing grass seed, sod can be installed year round with excellent success! Then, within weeks, you will have a dense, well established, usable lawn. Sinking your toes into a lush green carpet of lawn never felt so good! Contact us to set up a consultation today! Do you have a shady area that you are constantly over seeding with no success? Or an area that is not accessible to a lawn mower? Synthetic turf is the solution! Synthetic turf that’s late-summer long, or putting-green short, is available to emulate fescue, zoysia grass, bermuda and more. The turf is created with multiple colors of greens and tans, with and with out thatch, to look and feel real. During times of drought, your lawn will look the best in the neighborhood and you don’t even have to mow! Golfers, give us a call. 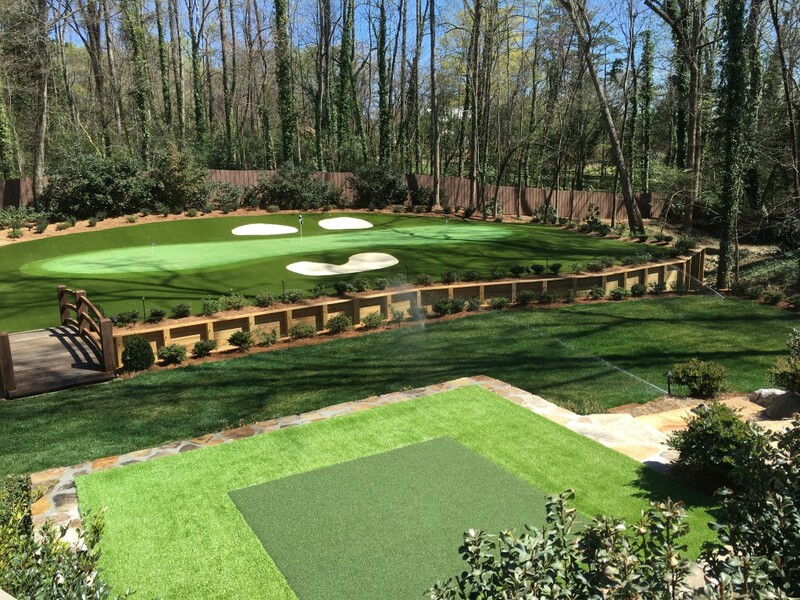 We can create a chipping and putting green right in your backyard! View more examples of perfect lawns!